Welcome to March’s Automox Patch Tuesday breakdown. This month’s Patch Tuesday included a total of 1440 distinct patches for over 60 vulnerabilities, with 19 of these vulnerabilities deemed critical. For a more in-depth review of the latest Microsoft Patch Tuesday security patches and to learn tips for automatically protecting your infrastructure from the vulnerabilities summarized below, join us during our March 21st webinar with Adam Whitman, Senior Technical Support Engineer. Like last month, all of these vulnerabilities allow for remote code execution across Microsoft products, including Edge and Internet Explorer 11. The sole unique risk in the group comes in CVE-2019-0592, allowing for privilege escalation in Microsoft Edge. Overall, Microsoft issued over 1400 distinct patches for over 60 different vulnerabilities this month alone. Few were disclosed beforehand, further complicating the job of keeping track of patches. With many issues impacting much older versions of Windows, the need to immediately upgrade to the latest versions of your OS, apps, and tools is clear. You may have seen the latest Chrome zero-day, released last week and profiled by Automox. The vulnerability actually stems from a Windows 7 issue, flagged this week in CVE-2019-0808. Combined, the two issues can allow a hacker to escape Chrome’s sandbox tools and run code on local machines and servers. According to Microsoft, the issue only impacts Windows 7 and Windows Server 2008 builds, but as always, upgrading to the latest versions of your desktop and server OS is the most impactful change you can make. Microsoft also introduced a relatively silent change in its Preview builds to how its Windows 10 OS handles patches that notoriously break or fail to install. New functionality automatically detects if a patch leads to failures or what the OS determines to be issues, and reverts to the previous build for 30 days or until a new update is available. Sounds good, but what’s the catch? Relying on the machine to dictate whether or not a patch should stay installed means that your organization will feature many different Windows 10 builds at once, with limited visibility into which devices are out of date and which are pending an update. Prepare now for the wave of support tickets about machines restarting and patching out of band, or displaying new, unfamiliar warnings. Automox can help ensure your systems are adequately patched in a timely manner in order to protect your organization against any of these vulnerabilities. As a best practice, you should always ensure that you have at least one patch policy assigned to all of your devices for Critical, Medium, and Low severity patches. These updates are generally Security and Cumulative software updates. Automox is designed to automate your response to zero-day vulnerabilities like this and others across the Windows, Mac, and Linux operating systems. 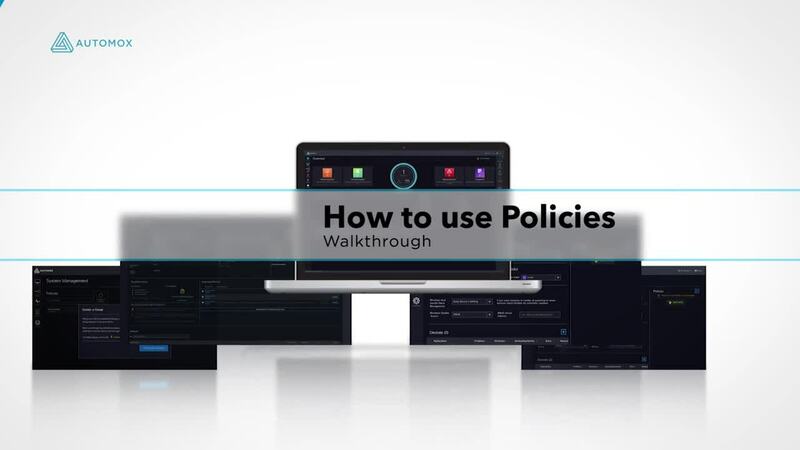 Current Automox customers can create policies that automatically handle the patching and execution of important updates for you every single month (see video below). Alternatively, you may contact our support team for any technical assistance at support@automox.com. If you are not currently an Automox customer, we invite you to sign up for a free 15-day trial of our cloud-based, automated patch management solution. Visit www.automox.com/signup to get started.